Zazzle Top Ten Christmas Best Sellers For 2013 - Success! With the Christmas holiday shopping season in full swing it's time to share our Zazzle Top Ten Christmas Best Sellers! No matter how long you're in the Print on Demand game, Christmas remains one of your best selling opportunities. Once we got more strategic with our business, we began to keep track of our Zazzle Top Ten Christmas Best Sellers in order to capitalize on related products to cross-sell. 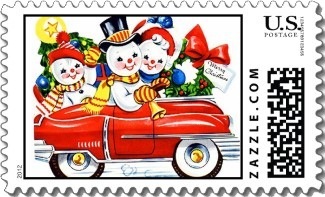 Christmas postage and address labels are two of our biggest category sellers in our Zazzle store every year. The synchronized aspects between the two product categories benefit sales performance in each. When you're merchandising your own print on demand store (whether Zazzle, Redbubble, CafePress, or another provider), good practice is to identify associated items your buyer will want to know about. Pete's latest e-book, Zazzle How2 Write Product Descriptions For Views and Sales, helps you capitalize by putting your descriptions to work for greater search visibility and related product sales. We've been noticing more multiple related item sales since he's put his own recommendations to work in our product descriptions. Creating your own lists of Zazzle Top Ten Christmas Best Sellers from your store analytics will give you a better understanding of what's working in your own merchandising as well. To add a little perspective, we currently have 776 Christmas stamps and 654 Christmas return address labels.